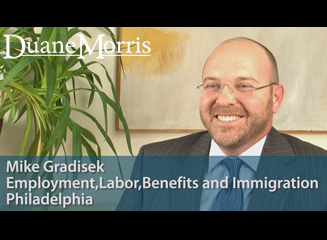 How does an employer create and maintain effective employee benefits and compensation programs? The process requires the delicate balancing of employee needs, company culture, cost, competitive pressures, and administrative and regulatory complexity. Instead of offering "one size fits all" services, the members of Duane Morris' Employee Benefits and Executive Compensation (EBEC) Group recognize that creative thinking, planning and a thorough understanding of the client's unique needs are an essential prerequisite to offering legal services that are in-line with each client's expectations. Our attorneys provide clients with the full range of employee benefits legal services. From qualified retirement plans to sophisticated equity compensation arrangements and from executive employment agreements to broad-based health and welfare plans, the members of the EBEC Practice combine practical experience with high-quality and efficient service that leads to practical solutions. Our attorneys design and draft NQDC plans and counsel clients on all aspects of their plans, including compliance with Internal Revenue Code section 409A. Our attorneys are currently providing guidance to clients on NQDC plans and the issue of pre-409A grandfathered deferrals and transition into Code section 409A-compliant plans. Our attorneys design, draft and counsel clients on the tax and design implications of executive compensation plans, as well as related federal and state securities law, employment law and accounting considerations. Our attorneys are sensitive to the related benefits and compensation issues that impact transactional matters. When appropriate, we interface with our corporate, tax and finance attorneys to provide a complete range of services. Frequently, litigation in the employee benefits area is based on faulty or incomplete communications of the salient provisions of retirement and welfare plans. Further, the government is requiring the communication of broader and more detailed information in connection with these plans and programs. Our attorneys have considerable experience preparing and reviewing communications materials, ranging from summary plan descriptions to COBRA and other notices to specialized materials for executives. We often create information packages that are both comprehensive and comprehensible. Benefits-related litigation is one of the fastest growing sectors in the federal court system. Our attorneys work with employment and litigation attorneys to represent companies and individuals involved in benefits-related disputes. Often, these simply involve the application of the claims procedures set forth in retirement and welfare plans. However, with increasing regularity, we find these matters moving through the court system or to another dispute resolution process. For more information, please contact W. Michael Gradisek or any of the practice members referenced in the Attorney Listing.